I don’t read psychological thrillers very often. It’s not that I don’t like them, I do. It’s that they tend to keep me up at night and turn me into a shivering pile of goo. I have a very active imagination, and it comes alive when I read. As in, really alive. So alive that I see things streak across the room and hide under the bed, the better to grab me later when I’m trying to sleep. So when I pick up a psychological thriller I have to be ready for about a week of paranoia. 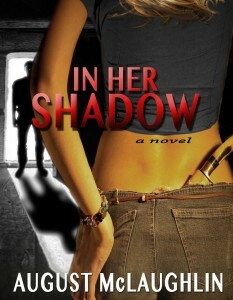 In Her Shadow is the debut novel by August McLaughlin. Did it keep me up at night? Yes! Did it creep me out with thoughts of what people will do to one another? Hell yes. It took me to dark, scary places and turned out the light, then twisted a knife in my back. I liked it, in other words. It did everything a thriller should do, particularly this kind. There’s underlying subtext of eating disorders and child sexual abuse that are dark, horrifying, and aren’t even worst part of the story. It travels a deep, dark, winding road into crazy. First Line: “She gulps the swig of poison like an eight year old inhaling cough syrup—nose plugged, eyes squeezed shut, her face pulled into a tight round ball. Toxic, metallic tasting vapors trail the liquid down her throat, filling her with venomous stench and nausea. Swallow, she instructs. Gulp. Breathe. There, that’s it. She did it. These first lines hooked me for so many reasons. Why is this girl killing herself? Why had someone forced her to eat a candy bar? What the heck is going on? Enough to keep reading, and enough to set the tone for the whole story. Horrifying. I’m there with this girl immediately. Another thing I loved about this story was the hint of something paranormal or supernatural or psychic going on. No, it’s not a fantasy book. But it has just enough weirdness to grab my attention and not let go. One word about the structure. I’ve mentioned it before, several times, that I’m not a fan of present tense. This novel is entirely in present tense. It really did bother me all the way through the story, but…I almost thank the author for it. Why? Because I was so freaked out by the story that the present tense pulled me away enough to enable me to finish reading it. I know, I’m very strange. Here’s the thing…to me, present tense is meant for screenwriting. It’s distancing. It puts the reader at the point of view of a camera looking at a scene, rather than allowing the reader to become part of the scene. That generally drives me crazy, because I want to crawl inside my stories and live there. I can’t do that if I’m way out in left field with the camera. The only time present tense works for me is if the story is dialogue heavy. It’s just not as noticeable if it’s full of talking bits, which makes perfect sense since, after all, it’s meant for plays and movies (mostly talk). This story is not dialogue heavy, and it’s not an action thriller. This is a psychological thriller, so the mind plays a huge part and dialogue doesn’t. I was constantly tripped up by the “s” at the end of words. Yes, it bothers me that much. That said, I wouldn’t discount the story for my personal preference and like I said, in this case it let some of the tension off the hook for me and let me enjoy the story instead of clutching my Kindle as melted into a quivering tiny ball in the corner. Besides, I could see this as a movie and in that case, half the script is already done. If you like dark psychological thrillers, give this one a try. What do you think about present tense in novels? Does it bother you?